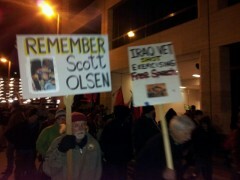 OccupyMN rallies in solidarity with Oakland, against repression of Occupy movement | Fight Back! Minneapolis, MN - More than 200 people gathered at People’s Plaza in Minneapolis, Nov. 2, to stand up for the right of assembly and to protest government repression of the Occupy movement around the country, particularly in Oakland, California. Speakers at the rally also denounced a new statement by Hennepin County threatening to end the OccupyMN occupation here in Minneapolis when the temperature hits 25 degrees or at the first snowfall. Several speakers at the rally expressed solidarity with Occupy Oakland, which called for a citywide general strike Nov 2. Oakland’s action is in response to severe repression last week, when the police forcibly evicted the Occupy Oakland protesters from a park. 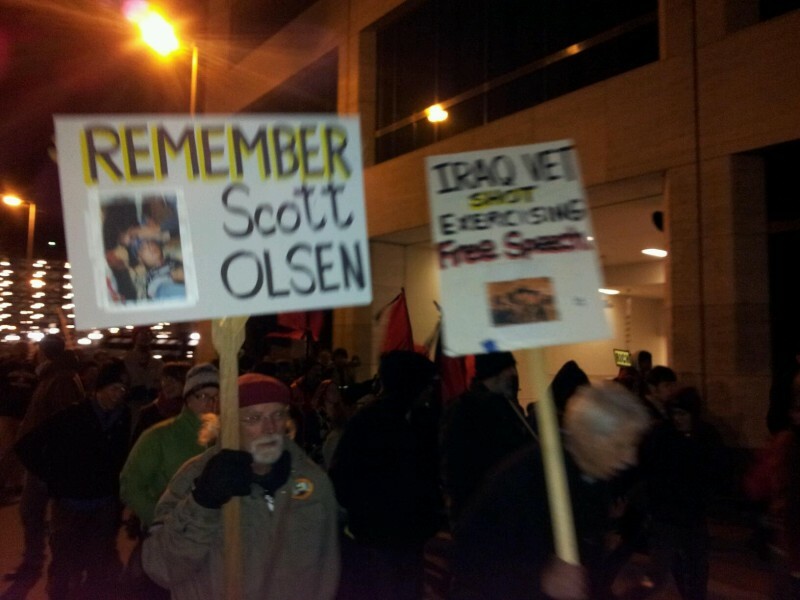 The Oakland police carried out mass arrests, used tear gas, concussion grenades and other projectiles against them, in the process hitting protester and Iraq War veteran Scott Olsen in the head, fracturing his skull. As he lay bleeding on the street and other protesters came to help him, police fired a concussion grenade to prevent them from helping evacuate him. In the aftermath, the Occupy Oakland General Assembly decided to call for a citywide General Strike. Ray Camper of Iraq Veterans Against the War and Gerald of Veterans for Peace spoke at the rally, expressing solidarity with Scott Olsen as fellow veterans. Tracy Molm of the Committee to Stop FBI Repression spoke about the repression against the Occupy movement in the context of the broader repression faced by many people who try to exercise their rights to expression and protest. In response Mel Reeves, an emcee of the protest, said, “The right of assembly doesn’t end when the temperature hits 25 degrees or at 10:00 at night.” Speakers at the rally decried the announcement from Hennepin County as an attempt to end the Minneapolis occupation. Occupations on the East Coast have continued this week despite a large snowstorm there, including the flagship occupation of Zuccotti Park at Occupy Wall Street. After the Minneapolis rally at People’s Plaza, there was a spirited march through downtown Minneapolis in solidarity with Occupy Oakland. The Occupy movement is focused against economic inequality, as the big banks and super-rich get richer while 99% of the people continue to suffer the effects of the capitalist economic crisis: unemployment, foreclosures, budget cuts and stifling amounts of debt.